Mostly these emails are sent automatically. Some of them are sent when a staff user clicks a certain button. You can set a return email and name for all those emails. It will be displayed in the "From" header. Commonly a no-reply email is used here. 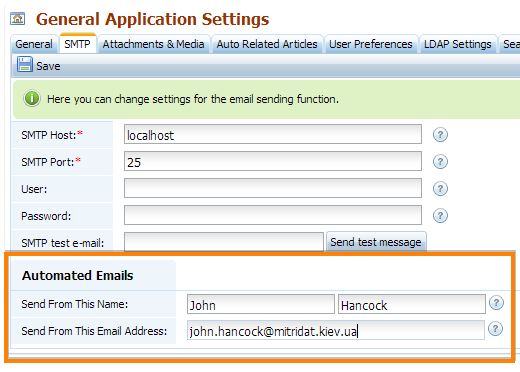 Please do not leave these fields empty, as it may prevent emails from sending on some server configurations. Question Submitter - the email of the person who submitted the question will be used as the return email. "No-reply" email - the setting for automated emails described previously will apply. The email of the person who submitted the question will be added to the Reply-To header of the email. This means that when you reply to that email, you will see the submitter's email in the "To" header so unless you change that, you will still be replying to the author of the question. These settings have been added because at some circumstances it is required if the return email matches the email of the question author. That's the case if you're forwarding questions to a ticketing system and it needs that to detect the author. On the other hand some mail servers do not like when a third-party email is being used as return email and may block it or move to the spam folder. In that case it is recommended to switch to the "No-reply email" option.